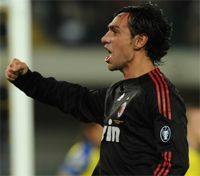 AC Milan Confirm Alessandro Nesta Nose Surgery - 28 October 2009 - . :Alessandro Nesta:. AC Milan defender Alessandro Nesta has had minor nasal surgery after fracturing his nose during the game against Chievo Verona on Sunday night. The Italian defender grabbed a late double which allowed his side to win the game 2-1, but his night was spoiled as he sustained an injury to his nose. The Rossoneri have now confirmed surgery has taken place, but it will not have any effect on the player as he will be back in action on Tuesday. "A.C Milan communicates that Alessandro Nesta underwent surgery that was carried out by doctor Paolo Marconi regarding a microfracture to his nasal bones. "The player will be available for Tuesday's training session ahead of the Napoli game."